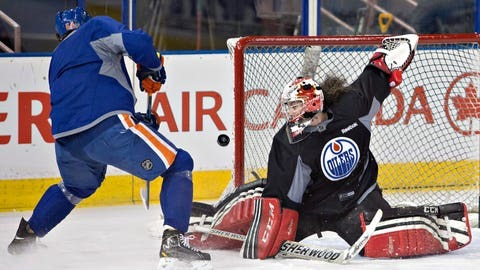 Canadian Olympic women's team goalie Shannon Szabados makes a save on Nail Yakupov while practicing with the Edmonton Oilers on Wednesday. EDMONTON, Alberta (AP) Olympic champion women’s goalie Shannon Szabados took the ice with the Edmonton Oilers at practice Wednesday. The Team Canada goalie filled in at practice for the National Hockey League while the Oilers waited for Viktor Fasth to arrive after a trade with Anaheim. Szabados got the invite last night after fans on Twitter tried to convince the team to put her on the roster as backup goalie for its game against Ottawa. Szabados says she was thrilled by the social media campaign and the Oilers’ players welcomed her at practice.